Thursday April 13, 2006, noon until 2 p.m.
Texts by Hideto Fuse, Barbara Nemitz, Karl Schawelka, Thomas von Taschitzki et al. Pink: things tender, eccentric, sweet, fragile, and delectable are affiliated with this pastel color. Few colors trigger more contradictory associations and emotions, so that artists of all hues�from Jean-Honoré Fragonard and François Boucher, Caspar David Friedrich to Louise Bourgeois, Wolfgang Tillmans, Mike Kelley, Minako Nishiyama and Takashi Murakami � have studied it in their works. Reactions to pink are determined by various factors, such as one�s cultural background. There is a positive perception of pink in Japan, for example, where every year people contemplate the pink blossoms of the cherry trees and the leaves which, after just a few days, drift like snow to the ground�symbolic for the death of the samurai, who falls in the bloom of youth. As the cherry trees blossom, this book on the nature of pink makes its debut, featuring works by almost fifty international artists and additional young talents from the Bauhaus-University Weimar and Tokyo National University of Fine Arts and Music, Tokyo Geijutsu Daigaku. It is the result of an unusual intercultural discourse, initiated by the artist and art professor Barbara Nemitz. 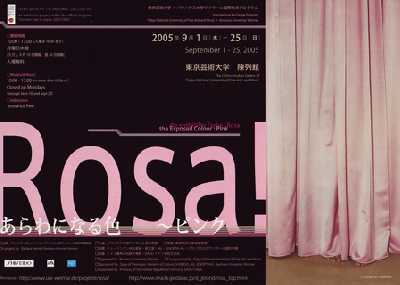 Exhibition "The Exposed Colour: Pink"
Opening: 1 September at 2 p.m.